A loving dad’s surprise gift to his little girls with memories to last an eternity. A lucrative child control industry has emerged in America’s divorce and family courts, inflicting moral, educational and productivity declines among our cities, towns and villages. It has made us the most litigious nation in the world as we spend our valuable time and energies on court contests instead of more constructive pursuits. It’s one thing when the fight concerns products or property but quite another when innocent children are exploited. As parents bound by laws of nature, we cannot remain idle in this escalating crisis while lawyers, bureaucrats and “experts” profit at our children’s expense. How many little ones will never see a good education or career in today’s competitive global market because their parents squandered life’s savings on endless court battles? It’s not all our fault despite what many judges claim. They know privately that needless court battles are ended only because the money runs out. In the meantime, they could care less that our children or families suffer. Outdated custody doctrine is vigorously retained over shared parenting because unequal classifications beget controversy which, in turn, justifies state intervention. It is a crisis created by socialist-liberals who made the policy case long ago that government is better suited to raise our children. Hillary Clinton made the same case against both moms and dads in her 90s era book, “It Takes a Village.” Her propaganda sounded good at the time because children were used as a pretext for big government, but it resulted in further erosion of parental authority, leaving minors free to set their own standards of behavior. Almost anything a parent does today to correct a child can be the subject of an agency inquiry, school report or custody impairment. In plain terms, Hillary’s village works like this: get the people of a community gossiping about their neighbors’ private affairs. Convince them to report objectionable styles of parenting to authorities. Once under a court’s jurisdiction, these fit parents can be conformed to an elusive standard for lawyers to argue and profit over. It goes on all the time in divorce and family courts with “parent education” programs and court ordered evaluations. This is our latest series regarding court corruption entitled “Kendra’s Chronicles.” Here we provide you with real life injuries caused by socialist policies injected into family litigation. Judges overwhelmed by their “super-parent” roles and overcrowded dockets issue orders based on scripted testimony or lawyer summaries having little regard for the human tragedies they produce. It can easily become a “turn ’em and burn ’em” enterprise. In “King’s Chronicles” we showed you how a new family judge named Daniel King of Lowville, New York abused state power in retaliation for Dr. Leon Koziol’s public criticisms and reform testimony before the Moreland Commission on Public Corruption. His criticisms included King’s fabricated college degree, parenting conditions in violation of a higher court order and impositions which placed his critic (Koziol) under risk of contempt by ambush. Ultimately two innocent children were denied access to a fit and loving father for a period of 456 days and counting. This human rights atrocity committed upon Dr. Koziol was orchestrated through absurd parenting conditions added with each public criticism until Leon was forced to abandon his role as a natural father. Here we give you some heart wrenching consequences of Dan King’s egotism in a court which might as well be located in Hillary Clinton’s village. DADDY, I WANT TO GO THERE! Author’s note: My daughters’ names have been substituted with “Shelly” the elder and “Debbie” the younger for purposes of this website post. Collectively, and with further editing, this series will comprise a part of my book to be published later this year. It was an uncontrolled scream from a five year old girl which I will never forget as long as I live. Only words, I’ll admit, but they were the world to me coming from my eldest daughter as I opened the front door to our home early one morning. There in the distance was an elaborate playground constructed specially for her and her sister as a father’s day surprise. The year was 2007, a long time ago, but only if you measure it as a business person. I can recall every detail of Shelly’s facial expressions as she took in something bordering on paradise. Miraculously it had appeared overnight. That was enough for Debbie to exploit the moment, shoving past her older sister into the sunlit yard with a sound that ignited sparrows, robins and blue jays from all surrounding tree limbs. As if on cue, our nearby frog pond erupted with croaking and splash-outs. Well it worked! All my efforts to make this event a memorable one paid off. You might call it perfect. But you should also know that it was anything but easy. I had to order the apparatus from Georgia and have the area excavated, rearranged and protected by two retaining walls. On one occasion, I rode my girls on a bobcat during a clearing process to give them a sense of participation in this project (with no idea of what was coming). I never disclosed this fact until just now, so don’t report me to their mom. 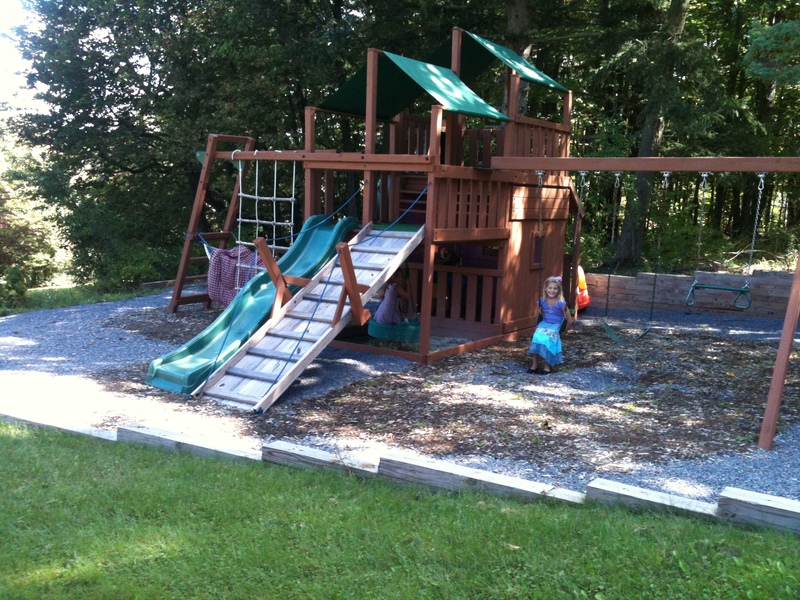 When the playground components arrived, my contractor went to work (as I did to my law office to pay for it all). After several days, the assembly phase turned into a real mess. The guys could not seem to put everything together properly. I was furious when learning of it outside the courthouse. But that’s where the rescue came in. I was representing an old college friend who I had just gotten out of a real mess of her own without any fee. She owned a ranch and knew a few things usually reserved to men. Hearing my dilemma, she quickly offered to rectify the errors. With the help of her woman assistant, she completed paradise in time for father’s day. Favors have a way of coming back around. This client will be forever remembered for her rescue as will another very special woman who arrived one year later, about the time when a trampoline was added to the mix. Together we made this place a regular treat for my little girls. These are exciting stories reserved to a later episode in this series. You might think that a private playground of this caliber meant that my girls would become spoiled. Quite the contrary, they enjoyed the public venues even more. I can still remember Shelly, she couldn’t have been but one or two, dutifully lugging her “Blues Clues” up the ladder with endless repetition before throwing the poor puppy down the slide with a glee that resonated across New Hartford Town Park. And Debbie, running off to the “wilderness” (trail system) which had me split in every direction. At Lake George, our summer destination, I will never forget a playground near East Cove where the girls enjoyed themselves as much as they did boating and swimming. I don’t believe those outings were eclipsed until many years later when I took both up for their first para-sail adventure. And boy did I hear it from mom in a family court petition after that one! But she was a “custodial parent” by then which changed everything. I like to think I was different than most dads at these public playgrounds. While they watched or tended to their barbeque grills, I was chasing my girls all across the slides, monkey bars and whatever else was there to exploit. They easily made lots of friends because the other children would simply join in the games I made up to everyone’s delight. Some of the parents knew I was a lawyer and probably figured that our activities were liability-proof, or more likely that I had regressed to my own childhood. No matter. I didn’t really care. As a “non-custodial parent,” my time was sadistically limited by our courts, so I would be taking full advantage of such moments, knowing they would one day find their way into memories like this one. Although moms seemed to dominate these places, I actually think that playgrounds were constructed with dads in mind. Such fun places resonated deeply within my girls. That much I know. In practical terms, these playgrounds are all gone now. The one at my home hasn’t been visited in more than a year. But in my mind I can still hear the laughter, the crying, the giggling, whispering, and happy faces, indeed all the things that made them so special in their day. Yes, playgrounds were a means for overcoming that weekend warrior status accorded to fathers under “the law.” But above all else, they have reserved to another time and place the fact that my girls had a genuine father who loved them, then and now and for eternity. Administrator’s note: Dr. Koziol is offering professional assistance to family members seeking to publish books regarding their own court ordeals, see earlier posts here at Leon Koziol.com for details .